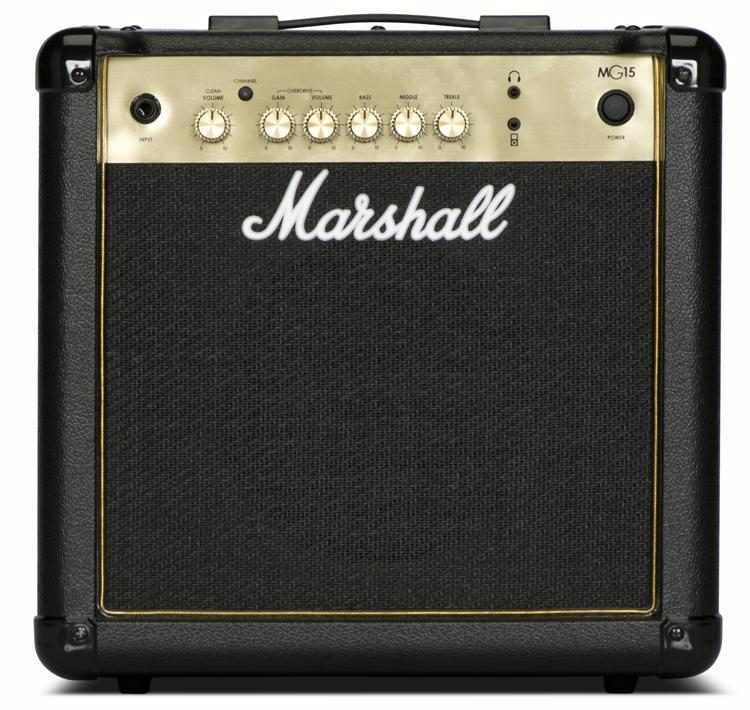 The Marshall MG15G is a VERY easy to use 15 watt guitar practice amp. It features a simple to use overdrive button which gives you a great range of classic Marshall tones ranging from mild crunch, hot bluesy sounding overdrive to full on heavy rock / thrash tones should you wish to crank it up to 11 !! In ‘normal’ mode the amp has a very sweet and natural clean sound if you don’t wish to get loud n heavy. It’s a versatile all-round good basic amp, but if you feel you simply have to have reverb too then go for the Marshall MG15GR. The Marshall MG15G Gold is a portable practice combo amp that delivers real Marshall tone and style. With its iconic ‘gold’ front panel and script logo, the MG15G offers a small piece of Marshall heritage in a portable grab-and-go package. It is the ideal amp for the progressing guitarist or for musicians who require a quality practice combo. The MG15G features 2 channels so you can achieve both clean and overdriven tones, allowing you to play all genres of music from clean pop through to heavily distorted rock and metal. The on-board 3-band EQ and reverb provides excellent tone shaping capabilities, letting you dial in the perfect sound for any situation and inject your tone with a unique sonic flavour. Its single 8” custom designed speaker is driven by 15 watts of power, offering plenty of power and tonal bliss for rehearsal spaces. This amp also includes a headphone output for silent practice, alongside an AUX-in; ideal for jamming along to your favourite tracks. The MG15G’s compact dimensions make it the perfect amplifier for practising and for transporting to band practices and gigs.